This past weekend, we took a family vacation to Greenville, SC. 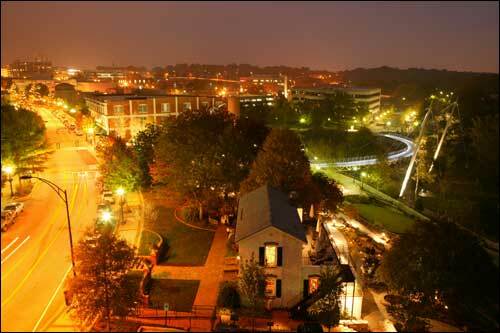 This was my first Greenville experience and I have to say I loved it. What a quaint town! We stayed right on Main Street so we were able to walk everywhere. Most of our time was spent downtown and in the West End area. There were tons of restaurant choices that were kid friendly and SO yummy. As you would expect in a downtown area, the shopping was also good. We enjoyed exploring the streets and parks. We spent a lot of time at Falls Park on the Reedy. Located in the Historic West End, this park is a nature lover’s paradise. We followed the Swamp Rabbit Trail (kids loved the name) along the Reedy River taking in the waterfalls and the beautiful scenery. 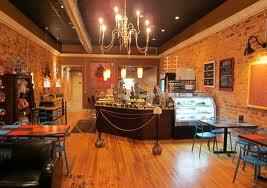 As a special treat for the boys, we had dessert on Saturday night at The Chocolate Moose right on Main Street. The kids had seen and talked about this place all day long so it was a highlight of the night. The boys choose chocolate mousse but this was not your ordinary chocolate mousse. Their mousse was a chocolate cupcake crumb bottom followed by a rich chocolate mousse, whipped cream topping and of course sprinkles. They devoured it in a matter of minutes! I decided to go for a cupcake. Their everyday flavors included black and white, chocolate, red velvet, vanilla, and vanilla with chocolate. Saturday night’s specialty flavors were carrot, chocolate tuxedo, lemon, and salted caramel chocolate. I have to say, they all looked amazing but I was craving the sweet and salty mix on Saturday. So I went for the salted caramel chocolate cupcake. I chose wisely!! This was the best cupcake I’ve ever had…ever. I’m still dreaming about it on Monday morning. 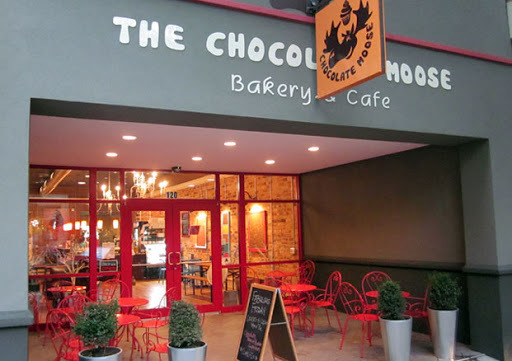 So if you are ever in the Greenville area, add The Chocolate Moose to your list. You won’t be sorry. 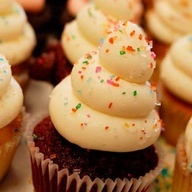 So now I’m on a mission to try to recreate this cupcake. I’m not a baker by any means but I’m going to give it a try. Thanks to Pinterest, I’ve found a couple recipes and some great pictures to drool over. Here are a few. 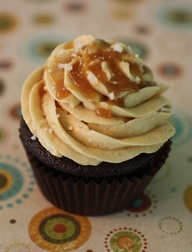 This one is called Chocolate “Wacky Cake” Cupcakes with Salted Caramel Buttercream. Prepare 2 regular cupcake pans (24 cupcakes). You can use paper cupcake liners or just spray the cupcake wells with cooking spray. Measure all dry ingredients into bowl and whisk to combine. Make 3 large holes in the dry ingredients. In a separate bowl, combine salad oil and vinegar. Pour this into the 3 holes. Pour the water over entire mixture. Mix with a fork. Add vanilla and stir. Divide evenly into the 24 cupcake wells. Bake for 25 to 30 minutes, removing from the oven as soon as a toothpick comes out clean. This can also be made in a 9 x 13 cake pan – bake for approximately 35 minutes. Add the sugar to a small saucepan and pour the water over it. With the heat on low, swirl the pan around until the sugar has nearly dissolved. Be careful not to let it boil. If it starts getting too hot, remove it from the burner for a few seconds, while continuing to swirl. 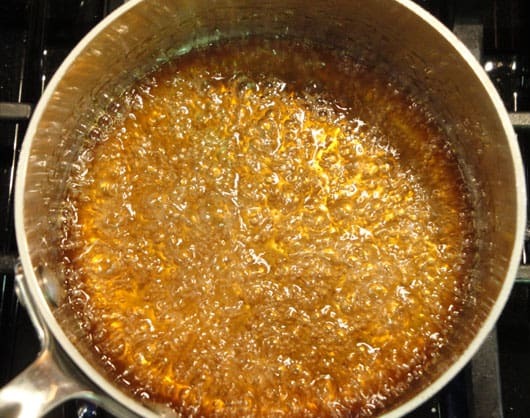 Once the sugar has mostly dissolved, raise the heat to medium-high and bring the mixture to a boil. Cover it immediately and let it boil for 2 minutes. Uncover and continue swirling the mixture until it becomes dark amber. Be VERY careful here. You want it to be dark, but it can go from dark to burning in seconds. Once it goes from golden amber to dark amber, take it off the heat immediately. This is what the sugar and water mixture looks like when it first starts to boil. Very near the dark amber stage, be prepared to get it off the heat FAST! Slowly pour in the cream, stirring with a whisk. Be careful, as the caramel will start splattering if you pour too fast. Whisk until combined and set aside. Let caramel cool to room temperature. 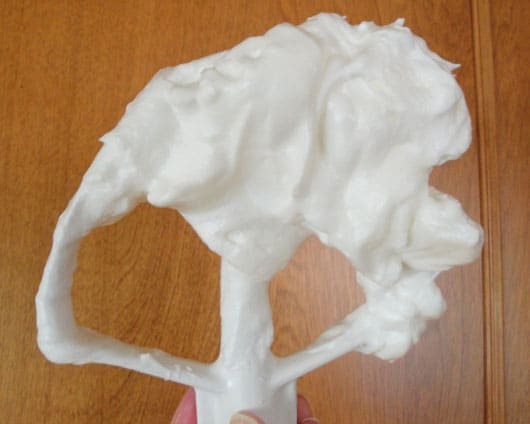 Combine the egg whites, sugar, and cream of tartar in the stainless steel bowl of an electric mixer (i.e. your KitchenAid bowl). Bring a large pan of water to simmer on the stove, making sure that when you place your mixer bowl into it, that the bottom of it is sitting in the water a bit. Set the mixer bowl in the pan of simmering water and whisk constantly until the mixture is extremely foamy and reaches 140 degrees on an instant-read thermometer. Be really careful not to curdle the egg whites. If it feels like that’s happening, just remove the mixer bowl for a bit. Remove the bowl to your stand mixer and beat on high speed for 3-5 minutes, until the meringue mixture holds glossy, marshmallowy peaks. Remove the meringue to another bowl and place the empty mixer bowl back on the stand mixer. Add half the butter and one-third of the meringue to the mixer bowl and beat until well combined. Continue to add the remaining two-thirds of the meringue a dollop at a time. The mixture may look curdled at this point, which is a bit alarming after going through all this work, but adding the remaining butter a tablespoon at a time will smooth things out. It really does come together at the end. This is what your meringue should look like. With the mixer on low, add the room-temperature caramel and mix until well-combined. Do not add warm/hot caramel, as it will melt the butter! Top your cupcakes with the buttercream, drizzle on your favorite bottled caramel sauce, and sprinkle with some flakey sea salt to finish them off. 1.Add the sifted cocoa powder to a medium sized bowl and pour in the cup of hot liquid. Whisk until completely dissolved. 2.Next add the buttermilk to cool down the mixture, then add the sugar and whisk until all is combined. 3.Add the eggs, oil and vanilla and mix again. 4.In a small bowl, stir flour, baking powder, baking soda and salt. Whisk this into the wet mixture until you no longer see any lumps. 5.Stir in heavy cream until evenly mixed in. 6.Pour into cupcake tins and bake at 350 degrees F for 18-22 minutes or until done. Let cool and chill in fridge for at least 30 minutes. 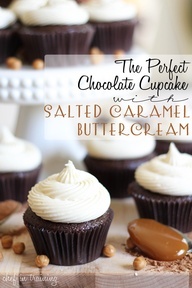 7.TO MAKE SALTED CARAMEL BUTTERCREAM: In a saucepan, stir together granulated sugar and water. Bring to a boil over medium high heat. Cook without stirring until mixture turns a deep amber color, about 10 minutes. Remove from heat and slowly add in cream and vanilla, stirring until very smooth. Let caramel cool for about 20 minutes, until it is just barely warm and still pourable. Alternatively, you could use just under 1/2 cup of your favorite caramel sauce. 8.Beat butter and salt together until lightened and fluffy. Reduce speed to low and add dry Dream Whip until combined. Next beat in powdered sugar. Mix until thoroughly combined. Scrape down the side of the bowl and add the caramel. Beat on medium high speed until light and airy, and completely mixed (about 2 minutes). Mixture should be ready to use without refrigeration. If your caramel was too hot when added, it will cause your icing to be runny. If this happens refrigerate for 15-20 minutes. Once cupcakes have cooled, frost onto cupcakes. 1.Preheat the oven to 350 degrees. Line a cupcake pan with 12 paper liners. 2.In a double boiler, melt the chocolate, butter, and cocoa powder. You can also do this in the microwave on 50% power for 30 second intervals, stirring after each interval. Set the mixture aside to cool, or keep it in the refrigerator until it is just barely warm. 3.In a small bowl, whisk together the flour, baking soda, and baking powder. In a separate bowl, whisk together the eggs, sugar, and vanilla. Add the cooled chocolate mixture and whisk together until combined. 4.Add 1/3 of the flour mixture and whisk. Add the sour cream and whisk to combine. Add the remaining flour mixture, and whisk gently until it is fully incorporated. 5.Divide the batter between the 12 cupcake liners. I used a cookie scoop to do this. Bake for 18-20 minutes, until a toothpick inserted into the center comes out clean. Cool completely on wire racks before frosting. 6.Make the caramel sauce and cool to room temperature. 7.In an electric mixer, beat the butter on medium high, speed until light and fluffy, about 3 minutes. Gradually add in the caramel sauce. 8.Put the mixer on low and add the powdered sugar and vanilla. Increase the speed to medium and beat until fully incorporated. 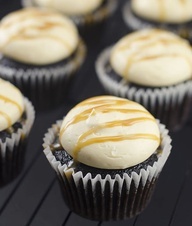 Pipe the frosting onto the cooled cupcakes and drizzle with additional caramel sauce if you wish. Note: This recipe makes enough to pipe large swirls of frosting on your cupcakes. If you are spreading the frosting, you may want to make half of the original recipe. I’ll need this too! Here’s the cupcake icing tutorial from Decorate This. Click on the picture for the link.